Should be acid with a pH between 4 and 6.5. Terrestrial species: Sphagnum moss living or dried, long fiber Or milled, sphagnum peat moss, various mixtures of peat moss with sand or vermiculite or perlite. Living sphagnum moss should not be used with the smaller species as it will quickly overgrow the plants. Aquatic species: Grow them in any container such as gallon jars, mayonnaise bottles, aquariums, terrariums, plastic washtubs, or outdoors in pools, natural or artificial. If grown in containers, 2-3 in. (5-7.6 cm) of soil should be placed on the bottom. Any planting medium may be used. If it is not acidic, the water can be acidified as per directions in Chapter 7. If sphagnum peat moss is used, soak it for about 1 week, then remove any material that has not settled to the bottom with a strainer. To condition the water for the plants, add a handful of sphagnum moss, living or dried, to the water if the medium is not sphagnum peat moss. Water depth should be at least 6 in. (15 cm). Many aquatic and terrestrial spp. will grow in very wet watery soils, often referred to as slurries. A slurry is made by mixing 1 part sphagnum moss living or dried or sphagnum peat moss to 1 part water.The slurry is then put in a drainless container and planted. U. menziesii which is native to southwest Australia, grows during the cool moist winter and survives the hot dry summer as a dormant tuber. Some of the species in Groups 1, 2, and 3 may stop growing during the winter but remain an evergreen. Terrestrial species: These species are maintained very wet or waterlogged durinj', the summer and drier during the winter. Uticularia menzesii—keep medium wet durinj; the growing season (winter) and dry during the dormant season (summer). Aquatic species: Grow the species in acid water, pH 5-6.5. If the water becomes alkaline, algae growth can become troublesome. Kits used to measure water pH art* available from stores handling tropical fish supplies. The same acids and procedures listed under Aldrovanda are suitable for use in acidifying water for Utricularia. One grower has found that dissolving 1/10 of a gram of copper sulfate crystals in 18 fluid ounces (540 ml) of water and then adding 1 fluid ounce (30 ml) of this solution fot each gallon (4 liters) of water in the Utricularia growing container kills unwanted algae He warns, however, that the weighing and dilution of the copper sulfate crystals accurately is of the utmost importance to avoid poisoning the plants. Epiphytic species: Thrive best when kept damp and in a highly humid environment. The North American species will thrive in strong light or full sunlight. The other species prefer indirect sunlight. Artificial Light: Group 3 species 500-1500 foot candles during summer. Winter 100-300 foot candles for those not forming winter buds. For turion-forming species no light is needed during the winter. Group 1,2, and 4 species 500-900 foot candles during the growing season. Group 1 and 2, 300-700 foot candles during the dormant or winter season. Group 4 needs no light during the dormant (summer) season. Photoperiod: Group 3 species Summer: 12-18 hours, winter: 8-10 hours for the evergreen species. Those forming winter buds need no light during the winter. Group 1 and 2 species Summer: 14-16 hours, winter: 12 hours. These species can be grown year around with the same photoperiod. Our experience indicates that flowering is more regular when the photoperiod is varied and the plants are kept drier during the winter. Group 4 species: 8-10 hours during the growing season (winter), none during the dormant (summer) season. Aphids and fungus are the only reported pests. See Chapter 8 for control measures. Terrestrial and epiphytic species are the easiest to grow. While many of these species will flower in cultivation, none can match the profusion produced by U. sandersoni. Once established it flowers continuously year in and year out. Some species have cleistogamous flowers, which do not open completely and will self-pollinate to produce viable seeds. The other type of flower which opens completely is called chasmogamous. Both kinds of flowers can occur on the same plants of some species. 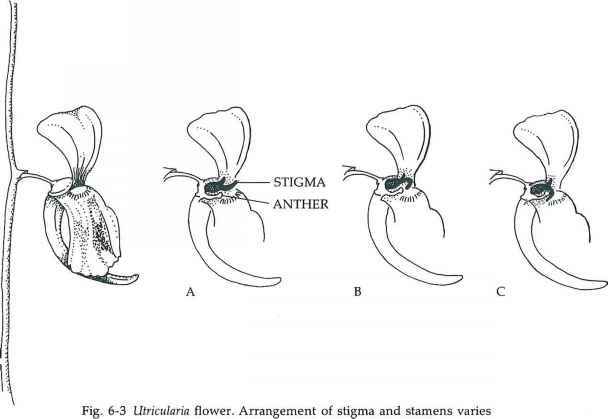 In some species the stigma bends over and covers the anthers, in others it is erect while in others the stigma bends over on itself, but does not cover the anthers. The anthers are positioned one to the right and one to the left of the stigma. (Fig. 6-3) The flower structure is designed to encourage pollen transfer by pollinating agents. 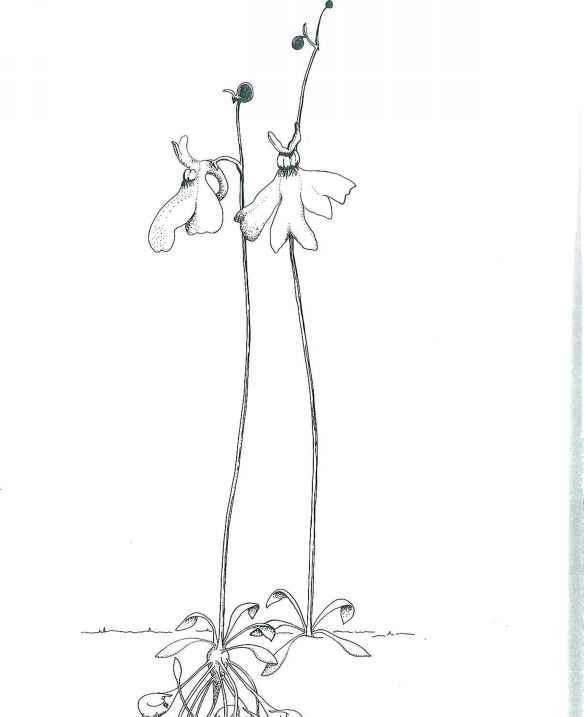 To see the stigma and anthers, grasp the lower lip and the upper lip and gently pull them apart. The flower will open as if it were hinged and the floral parts are exposed so that one may pollinate them to produce seed or hybridize them. To our knowledge no one has attempted to hybridize this group of plants. As mentioned before, the flowers of these plants are designed to require a pollinating agent. Yet under some conditions some plants produce seed without an apparent pollinator. Perhaps movements of the flower induced by winds may dislodge pollen grains which tumble onto the stigma. If the flowers are pollinated the ovaries will swell and in 4-8 weeks the seeds are mature which is evidenced by the almost translucent seed pod. Seed from the species that form winter buds must be stratified to germinate. Seed not planted is stored in vials or bottles under refrigeration. Seed of terrestrial species is sown on the medium while seed of aquatic species is sown on the water surface. Seed germination is quite variable and may take up to 2 months. Terrestrial species: Take a portion of soil with plants and divide it into 2 or more parts. Plant each part in a pot. They will multiply rapidly by vegetative reproduction. Aquatic species: Cut the plant into pieces about 2-4 in. (5-10 cm) long and replace in water. Each section will develop into a separate plant. Epiphytic species: Divide the mother plant into several smaller portions and repot. Fig. 6-6 Some Uticularia species form resting structures called winter buds or turions. Turion tend to be spherically-shaped. Fig. 6-7 Polypompholyx multifida plants including flowers, basal rosette of leaves and traps. The two species comprising this genus grow in Australia. 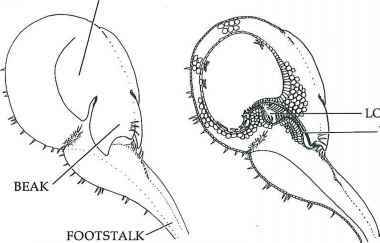 Both are very similar to the terrestrial species of the Utricularia genus differing only in sepal number and trap structure. Polypompholyx has a 4-part calyx whereas that of Utricularia is 2-part. (Fig. 6-7) Both species of Polypompholyx are annuals and are terrestrial plants. Polypompholyx tenella, commonly known as Pink Fans, grows in West Australia, Victoria and South Australia. Flowers and leaves are similar to those of P. multifida except they are smaller. Scapes seldom exceed 3 in. (8 cm), leaves are not more than 0.5 in. (1.3 cm) and flower diameter is less than V3inch (0.8 cm). There are 1-2 pink flowers with yellow palates per scape. Both species are annuals and will not self-pollinate. If they are grown in an area devoid of insects, the plants must be pollinated by hand to insure seed production. The flowers can be opened to reveal the sexual organs in the same manner as the genus Utricularia flowers. Pollen can then be transferred with a toothpick or brush from anther to stigma. Fig. 6-8 Polypompholyx trap and longitudinal section through trap. the area of both vestibules and in the lobby that direct prey to the door of the trap. (Fig 6-8) The overall structure of the trap is similar to a hand held palm-upwards with the fingers bent toward the wrist. The wrist is analagous to the footstalk of Polypompholyx while the openings between the palm and index finger and pinkie are similar to the funnel-shaped vestibules leading to the lobby and the trap door. Like Utricularia spp , the prey is sucked in when the trigger hairs are stimulated. Because of the close similarity of Polypompholyx to Utricularia, they are assumed to be carnivorous also. Any of the planting media recommended for terrestrial Utricularia spp., except living sphagnum moss, can be used for these plants. Living sphagnum moss should not be used because it will quickly overgrow the plants. A temperature in the 70-100 t (21-38°C) range is suitable. Indirect sunlight is adequate. If artificial light is used start with 1000 foot candles and a photoperiod of 12-14 hours. Aphids and fungus will attack these plants. See Chapter 8 for control of these pests. Plants can be fed the same material as the terrestrial Utricularia spp. Auguste de Saint-Hilaire discovered the plants upon which the genus Genlisea is based in Brazil in 1833. Warming published the first thorough description of these plants in 1874. How to separate staghorn pups from a mother fern. ?